Life as a mother consists of many days dressed in yoga pants and a messy bun on top of my head. Some days I feel like a failure when my husband asks if we are going somewhere simply because I’m actually get ready for the day. However, I’ve found that getting “dressed up” doesn’t need to take a lot of time or means. By simply learning how to accessorize, you can take any outfit from drab to fab. A simple statement piece necklace truly can change the look of your entire outfit. 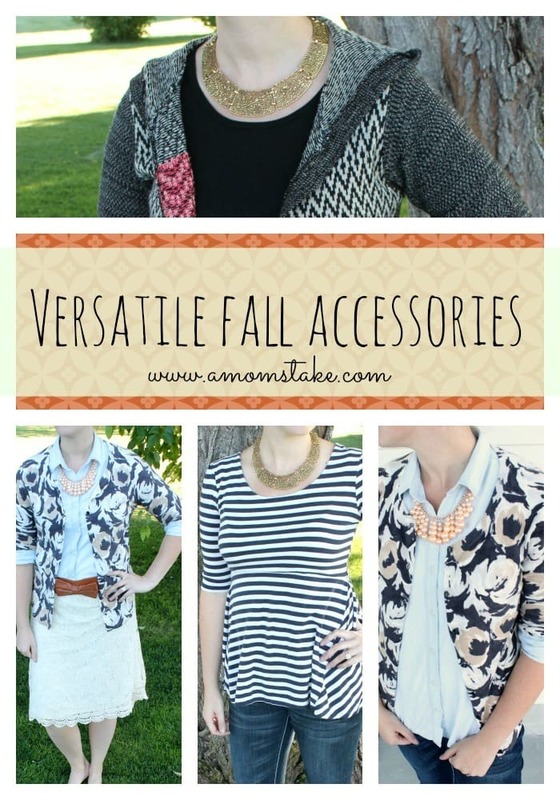 Check out some of my new favorite versatile fall accessories. I received Cate and Chloe jewelry in exchange for this post. Regardless, all opinions are my own. Inspired by the legendary Russian Grand Duchess, this Anastasia “Reborn” Statement Necklace ($59.99) provides the perfect touch of glitz and glam to any outfit. Adorned with rose pearls, this statement necklace is sure to be a talking piece. Pair this necklace with a chambray shirt, cardigan, and leggings and you’re ready for date night. Change the whole look of your outfit by slipping on a lace skirt. Simple elegance at its finest. Inspired by the famous tale of the beautiful Helen of Troy, this Helen “the Beautiful” Statement Necklace ($59.99) was crafted to reflect the immense beauty that is said to be the cause of the 10 year Trojan War! Featuring 11 rectangular gold pieces linked together in absolute style, this necklace is a must for every woman’s wardrobe. Want the perfect fall look? Pair this necklace with any cardigan or fun patterned sweater. Perfect for on-the-go moms, make a statement by wearing this necklace with a simple striped blouse. Look great this fall wearing Cate and Chloes versatile statement piece necklaces. Until the end of September, enter to win a 1-month VIP membership. Head on over to Cate and Chloe’s Facebook page to take advantage of this awesome contest. For max opportunities, enter to win 1 time a day. Contest open to US and Canadian residents. Both of those necklaces are fabulous! They really do add a lot to the cute outfits you had on. I love those outfits and the necklaces. I am not much of a jewelry person, but those necklaces have me rethinking that. Those are cute! I love the top in the last picture, the black and white. Very cute! I had to laugh, you poor dear wearing a sweater outside for the pictures. It will be cool soon enough! I am a very casual person. I live in jeans and a tshirt but I do love jewellery. The right jewellery can change an outfit. I love the pieces that you shared. I just love statement necklaces! How fun! I would love to try these ones out with some of my outfits. Statement necklaces are truly my fave accessory! They are easy to recycle and restyle every season, as you have shown how versatile they can be! Love it!! I love the sweater. I am totally a jeans and sweater kind of girl. You look so pretty! Perfect Fall outfits! I wan them all! I love this necklace and think it is really pretty! I feel you with the whole yoga pants and bun thing. Painting my nails and doing my makeup is huge these days! I am afraid jewelry is asking too much even though I have a ton. Great combinations. They are versatile! Love the skirt the most! I giggled when I read about how your husband asks if you are going somewhere… my kids do that to me all the time. If I put on makeup, suddenly we must be going somewhere. Sheesh! I guess I look like a bum the rest of they time. I love this necklace! So cute and yes, versatile! Love the striped shirt and jeans. Fall is my favorite time for clothes. I need to accessorize more, they certainly make the outfit! This season has some of my favourite colours, love it! Both of those necklaces are beautiful. I really like the “Reborn” one and could see myself wearing it a lot! Those necklaces certainly are cute. I love big statement necklaces!